Took this on the plane on the way to London! 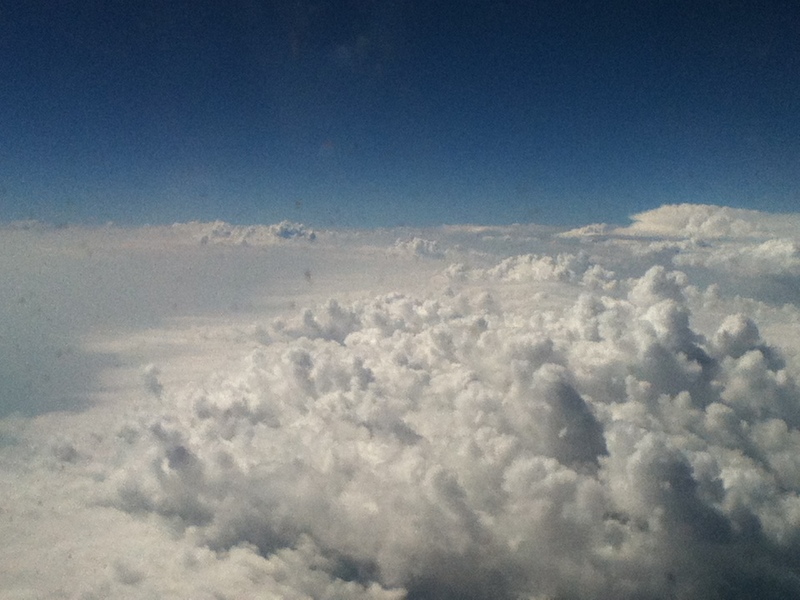 Just realized it looks like every other cloud picture ever taken, but oh well…. Hundreds of years from now, an old notebook will be discovered, in which a girl wrote about her thoughts and experiences as she travelled. People will marvel, at those things called ‘paper’, and ‘ink’. They will get a sense of what it used to be like to travel, with planes and trains, cabs and busses. They will be shocked at the fact that once upon a time, someone had to sit down and write what they were feeling, that they stopped because their arm was tired. But for now, in the present, I’m very simply keeping a diary. I’m a week and two days into my vacation, and my notebook has about 100 pages full of words. I’m now in London, and before that I was in Budapest (Hungary), and Bratislava (Slovakia). I’m travelling with my parents and two older sisters. – Babies! I just absolutely adore babies! Of course, there were many more, but I happen to not have my notebook with me right now. It’s actually not been such a great day, that’s why I have time to write. Here’s the part in most posts where the Fibromyalgia* segues itself in, and this post is like any other. It’s been hard travelling while not feeling well, extremely hard. It takes away from the enjoyment and the sense of peace and wellness you usually get on vacation. I so wish I felt better, I wish this didn’t have to segue in all the time (though I like the word ‘segue’). Despite all of that, and my bad mood today stemming from feeling like dog poo, I have been having a great time. It’s nice to not be at home, or at school. Change of pace, yeah? That was in a British accent. Almost everything they say here ends with a question, right? There it was again. In fact, I’ve been reading all of this in an accent. Random craziness, no? I’ve met bunches of interesting people, had experiences that I’m not sure I liked, but that I’ll never forget (and that’s worth something- I’ll probably write about a lot of them in the near future), and felt like I gained world perspective again and again. You know me, and my Big Thinking Moments**. Let’s just say that I feel like I have been living Big Thinking Moments most of the time here. No matter what the rest of vacation is like, it was worth it for those. Wow, well I’m glad I found my notebook just now. I don’t have anything else to add to that, I just really agree with myself. *Check out my new page, “Fibro- what? !”, for info on what that is. ** I hope I actually did explain those well enough, because I’m using the term as though everyone understands what they mean. Should I add a page about them? I recently discovered that you can add pages. It’s cool. I think I’m in love. Not really. I just like them. We have a friendly working relationship with them.